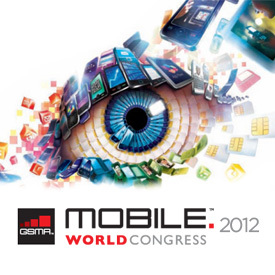 IndiaNIC appears at much awaited GSMA Mobile World Congress 2012 held at Fira de Barcelona, Spain. The event has – as expected, launched a flurry of new smart (super) phones, that are making the thin line between the desktop computing and mobile phones even more hard to distinguish. With nearly a dozen of new mobile devices launched on the very first day of the event, the MWC 2012 has kept its reputation of meeting with expected launches. The newly launched devices include Samsung Galaxy Tablet 10.1, Samsung Galaxy Beam, Nokia Asha Seriese, Nokia Lumia Series Windows Phone 7, LG Optimus 4X HD, Huawei Phone, Sony Experia X, HTC One X to name a few. The MWC is THE biggest gathering of all the gentle giants of Mobile Industry, Apps Developers, Cellular Network Providers, Application Platforms and many more. The much awaited event has started off with a series of forums and seminars covering up latest trends and on going questions to foster the mobile industry. The visitors include the people across the globe from China, Korea, USA, South Africa, Europe and just about from every corner of the world. The enthusiasm and the interest in mobile industry could be seen quite clearly by the congestion at all the entrances at Fira de Barcelona. MWC 2012 is expected to have more than 100,000 visitors during its 4 day schedule. The Mobile World Congress event comprises of 8 halls in total – including variety of stands covering up different business domains – including Apps Planet, which is a highlight of the application developers and the showcase of great mobile application development platforms and services. IndiaNIC is participating as Exhibition Visitor – with Mihir Rawal (VP, Business Development and Sales) and Jigar Panchal (Tech Manager). The Mobile World Congress has launched their official TV Channel that is broadcasting latest happenings, views and thoughts of the industry leaders on latest trends and solutions to improve the scalability of mobile industry – round the clock. The Mobile World TV channel is available in local channel network within entire Barcelona. Take a look at some of the pictures of the first day at MWC. Thanks for sharing this information. We like to have more day to day briefing to your tour on blog. Best wishes for your successful appearance in MWC at such a short notice. This is just beginning….Have a Successful Trip..!! Thanks for sharing wonderful information. Please accept my best wishes to get successful in this conference. All the very best and good luck. It’s really feel very proud to see indiaNIC at this International confluence with other IT giant.. Congratulation to team for their wonderful and excellent feat for representing indiaNIC at MWC. Wishing more feathers in the achievement of IndiaNIC. Bravo Mihir & Jigar !! Thanks for sharing us gorgeous pics. Please share which kind of new technologies you guys have explored there if possible. You will come with lots of new ideas and technologies with you when you are back with us, and it will be very much helpful to indiaNIC. Thanks for sharing about GSMA Mobile World Congress. We come to know about Mobile Technology.